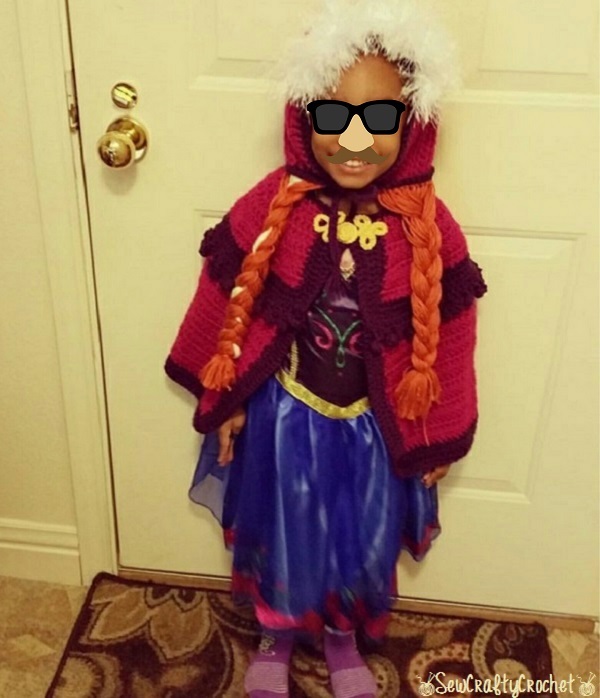 Last year for Halloween, my daughter informed me that she wanted to be Princess Anna of Arendale. She was Queen Elsa the year before. I am a major procrastinator, so I started working on my daughter's Halloween costume pretty late. Originally, I wanted to make the entire Princess Anna costume. I planned to crochet the whole thing. Then, I thought about crocheting the top of the dress and using tulle for the skirt of the dress. But time passed and passed, and I had yet to start on the costume. So I ended up buying a Princess Anna dress from TJ Maxx for only $12.99! The same dress was $29.99 at Joann's. 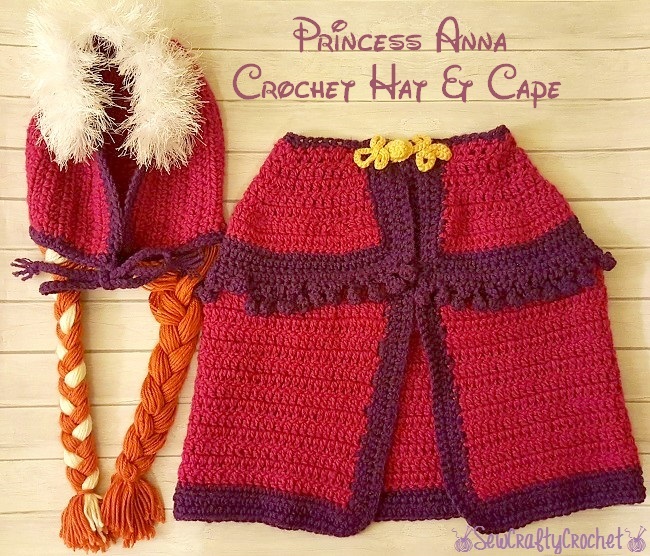 To complete the costume, I crocheted a hat and cape to keep my little Anna warm. 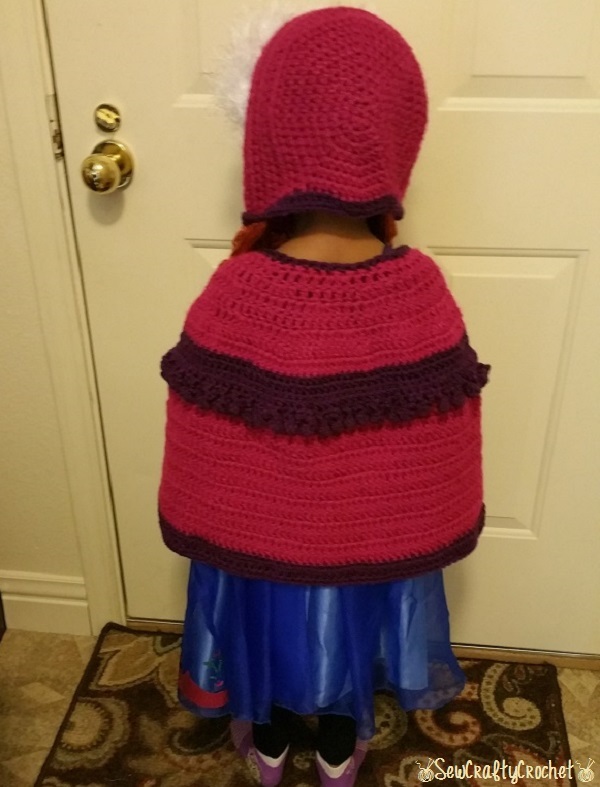 My mother and a mom from my daughter's preschool said that adding the crochet hat and cape made the costume perfect. They told me that the entire costume didn't have to be handmade. I think as a crafter, I put pressure on myself to make everything and to make it perfect. But now I see that they were right. My daughter was adorable in her costume, and I was very pleased with how the cape turned out. We received many compliments on the cape, and that made me feel great! 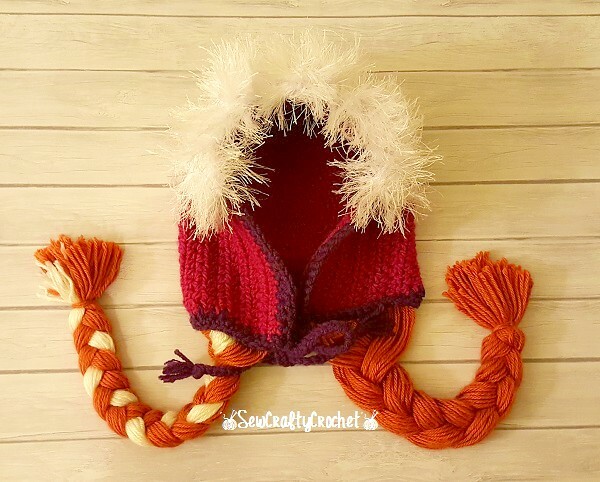 First, I made this hat, but then I found a pattern for a bonnet style hat, so I crocheted a new hat for my little Anna. 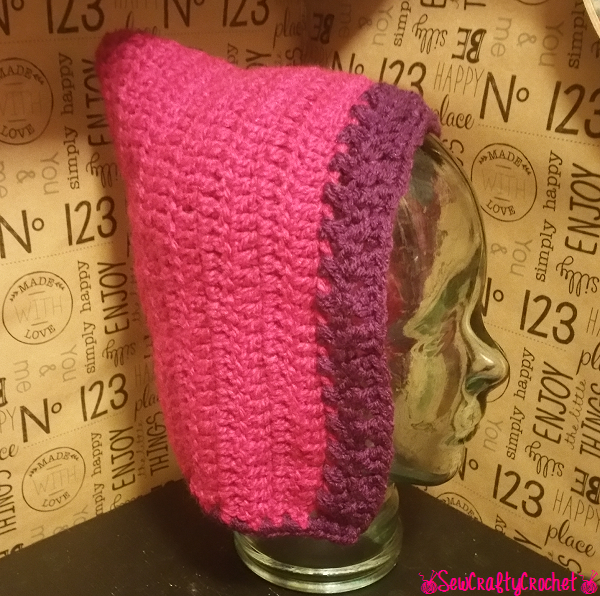 I used a pattern by Hopeful Honey to create this hat. Her hat includes crochet bangs, but I decided to make the hat without the bangs. I also added ties to the hat to make sure it stayed in place. 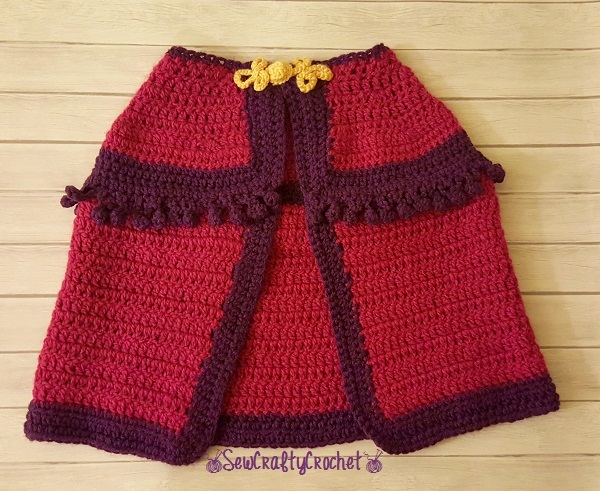 For the cape, I used a pattern by Lace and Whimsy. I had a hard time trying to find the perfect colors for the cape. I ended up using Hot Pink and Dark Orchid. Making the pom poms was fun and easy. 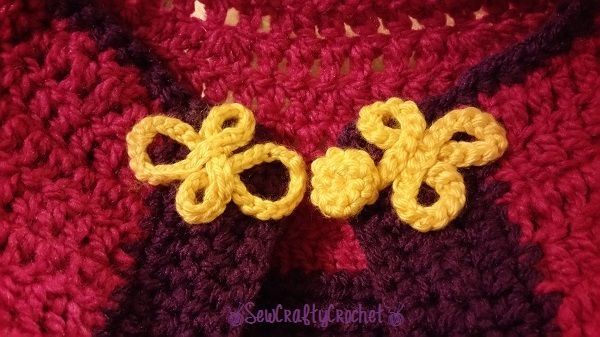 For the frog closure, I used the tutorial by Crochet By Faye. The tutorial included easy to follow pictures! Here's my daughter modeling the costume with the hat and cape. She's wearing purple Elsa socks. She wore black boots with the costume when we left the house. Here's the back of the costume. There was a costume parade at my daughter's preschool, and the parents handed out candy to the kiddos. It was so much fun seeing all the kids in their cute costumes. There was a lady bug, Princess Elsa, a couple butterflies, a Power Ranger, Rainbow Dash, and more. We only went on four streets, and my daughter's Olaf bucket was full! There's lots of good candy in there. We had M&Ms, Snickers, Reese's Peanut Butter Cups, Crunch Bars, Kit Kat Bars, and more! 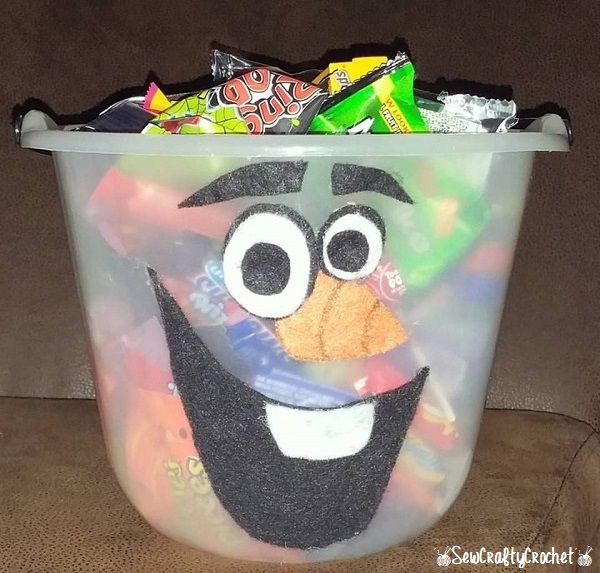 I put together an Olaf Trick-Or-Treat Bucket for my daughter last year, but it got a few cracks in it, so I removed Olaf's face from the old bucket and glued it onto a new bucket. We had a great time trick-or-treating, and I'm glad my little Princess enjoyed being Princess Anna for a couple days. Totally adorable. Bet she can't wait for Halloween. 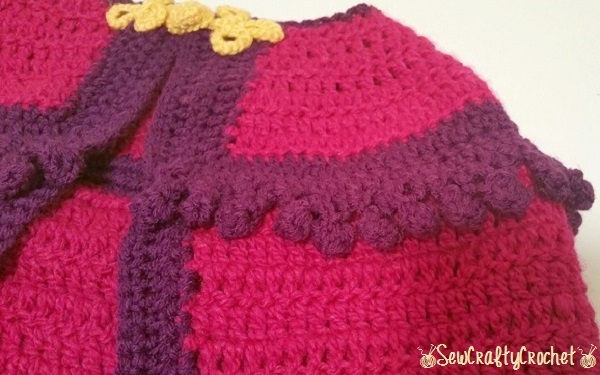 Thank you so much for sharing at Snickerdoodle Create~Bake~Make link party! You're so talented. I wish I could crochet and make costumes like that. Super fun! OhMyGoodness, this is SO adorable! I might just have to try this out for my daughter to play dress-up with! So happy you joined us at #FridayFrivolity this week! Thank you! That's a good idea!